The Chinese ship collided with a Greek ship near the Senkakus, which the Chinese refer to as the “Diaoyu,” prompting Japanese rescuers to come to the scene and search for the crew in the water. The Japanese officials have rescued six so far, while eight crew members remain missing. They responded to a distress call from the Greek ship, not the Chinese one. The Senkaku Islands are an uninhabited land formation in the East China Sea. While the rocky terrain makes them inhospitable for a permanent population, the location is resource-rich and, at the moment, teeming with valuable mackerel populations. As Beijing claims the islands for itself, hundreds of Chinese angling ships have taken to the disputed territory looking to harvest. The Japanese government has issued multiple protests to China over the large number of Chinese ships in the area, particularly armed Coast Guard vessels that have come to allegedly protect the fishermen. Japan estimates up to fifteen armored Chinese Coast Guard ships in the area. None of them acted to save the capsized ship on Thursday, however, possibly as a way to prevent conflict with their Japanese counterparts. The Japanese Foreign Ministry has issued a statement condemning the large presence of Chinese ships in the region. “Despite Japan repeatedly lodging strong protests with the Chinese side, the Chinese side has continued to take unilateral actions that raise tensions on the ground, and this is absolutely unacceptable,” the Foreign Ministry laments. The Chinese Foreign Ministry has responded by reiterating that China has “indisputable sovereignty” over the Senkaku Islands, though it has been unable to prove this through international law. Chinese territorial disputes in the East China Sea came to a climax of tensions in 2012, when Beijing installed an Air Defense Identification Zone (ADIZ) over the islands, which would require every aircraft that enters the zone to identify itself to China, even Japanese ones flying in domestic Japanese airspace. Japan ignored it and the United States issued a reminder to China that any attack on Japanese territory, including the Senkaku Islands, would require the United States to intervene militarily against those attacking Japan. China has since not enforced the ADIZ. 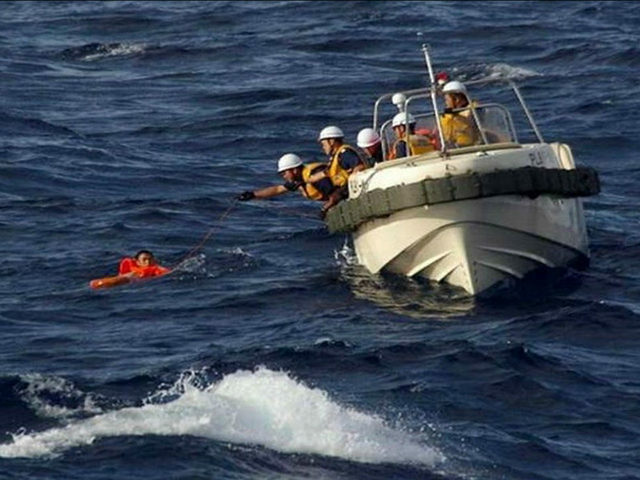 The Diplomat notes that Chinese users of social media were gracious in thanking Japanese rescuers for saving the Chinese fishermen, in what amounted to a rare display of gratitude and positivity toward Japan. The diplomatic tensions continue, however, as China continues to assert itself over the islands. China has already canceled a diplomatic visit to Tokyo later this month in response to the Japanese Foreign Ministry repeatedly calling for Chinese ships to vacate the area. Japan has another reason to worry about potential Chinese aggression, one that has little to do with the Senkaku Islands: the anniversary of the end of World War II is on its way, and officials have expressed concern that Japanese people in China may be the target of hateful attacks, particularly in light of the current territorial dispute. The Japanese embassy in Beijing is warning citizens in the country to take special care to avoid situations that may lead to harassment.